A look at the influence of our devotion to Mary, the Mother of God under the title of Our Lady of Czestochowa. She is not only the Queen of Poland, but the Queen in America. If you can make it to Jasna Gora, going to the National Shrine in Doylestown, PA, is a wonderful way to honor the Mother of God. 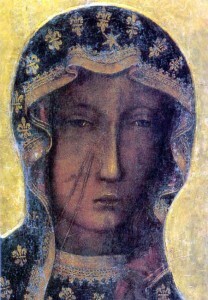 Our Lady of Czestochowa’s feast day is August 26. 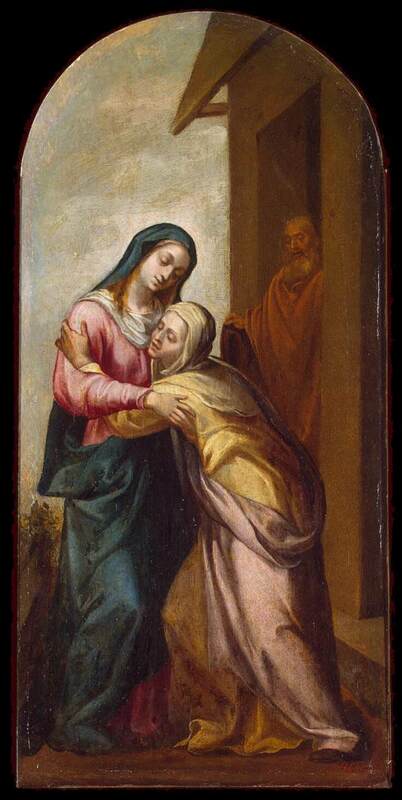 Today, the Church celebrates the Visitation of the Blessed Virgin Mary, the event of Mary visiting her council Elizabeth after the news from the angel Gabriel announcing to Mary that she was to become the mother of Our Lord. Mary went from Galilee to Judea to visit her kinswoman Elizabeth, the soon-to-be the mother of John the Baptist. The biblical narrative is found in Saint Luke 1:39-56. For us, John the Baptist is the final prophet of the Old Covenant and Jesus the first and the beginning of the eternal New Covenant. This icon is of the rare Byzantine icon of Agiosoritissa (Mother of God) of the 7th century. 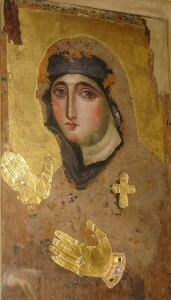 It is said to be one of the few Byzantine icons that survived from the iconoclast era. 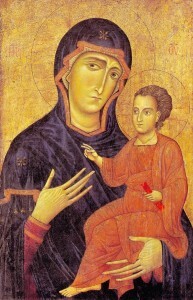 The icon is said to have been in the Agia Soros chapel in Constantinople (hence the name in the title). Indeed, a terrific gift to receive. The historicity of this beloved icon of the Virgin emboldens faith and lends credence to coherence of Christianity in time. The provenance is Constantinople located now at the Church of Santa Maria del Rosario a Monte, Mario, Rome. Dimension 42.5 x 71.5 cm. The Solemnity of Mary, Mother of God was just celebrated on January 1 and today is the first Saturday of January, a day in which we attend a little more to the devotion to the Blessed Virgin Mary. It is appropriate to stay close to the Mary in these early days of 2014 for it is Mary who will lead us into the arms of the Messiah. I came across this reflection on Mary by the Cistercian Father Blessed Guerric of Igny. As I have echoed so often before on these pages, a proper Marian theology always indicates a proper Christology. 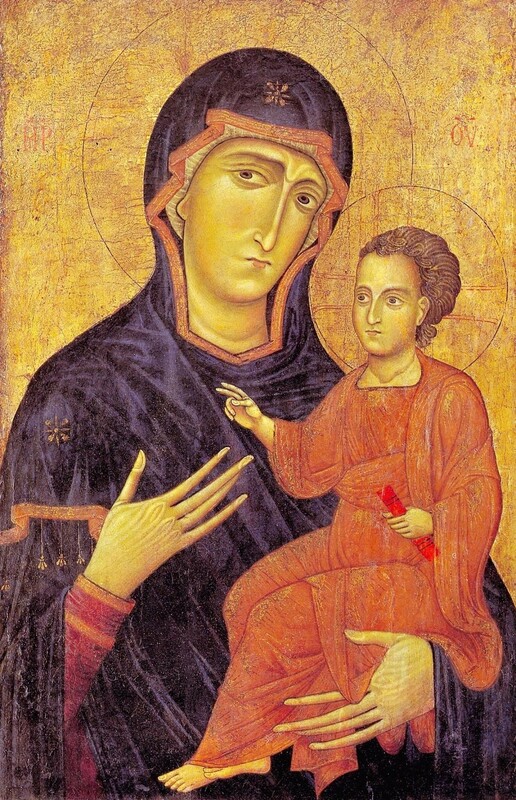 This Berlinghieri icon of the Theotokos (1230) illustrates what I think is the true Marian theology of our Church: to know Mary is to know, love and serve her Son. 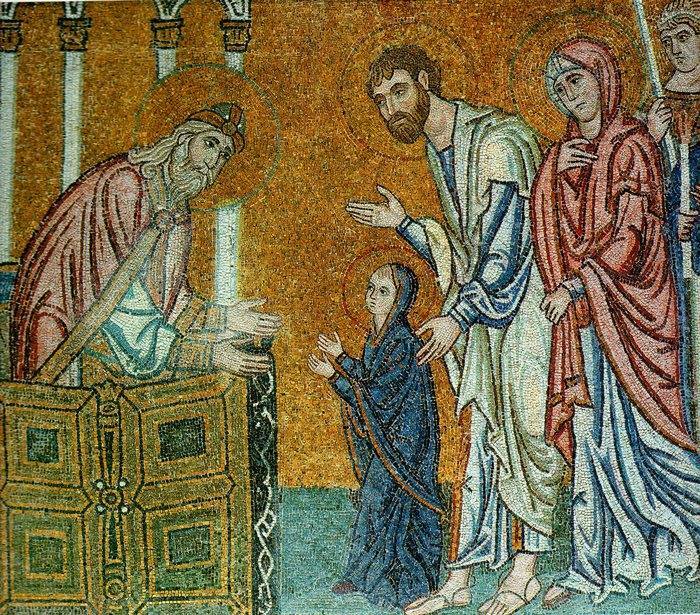 In the printed word, thanks to Blessed Guerric we have a great example of what the Church teaches: Mary always points to her Son and Savior; Christ is made known through the yes of Mary. Today, ask yourself, in our own body, do we say yes to Jesus Christ? 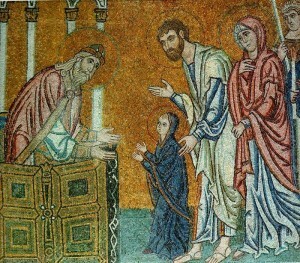 The Church liturgically honors Mary in her being Presentation in the Temple. The Byzantine Church calls the memorial The Entrance of the Theotokos in the Temple. It is one of the 12 Great Feasts. Mary, Ark of the Covenant, pray for us. With profound understanding she listened to the writings of Moses and the revelations of the other prophets when, every Saturday, all the people gathered outside, as the Law ordained. She learned about Adam and Eve and everything that happened to them: how they were brought out of non-being, settled in paradise and given a commandment there; about the evil one’s ruinous counsel and the resulting theft; about their expulsion from paradise on that account, the loss of immortality and the change to this way of life full of pain. She saw that as time passed, life continued under the inherited curse and grew even worse, God’s creature made in His image was estranged from the Creator and became more and more closely associated with the one who had evilly schemed to crush him. No one was capable of putting an end to this impulse which brings destruction on all men alike, or to the uncheckable rush of humankind towards hell.